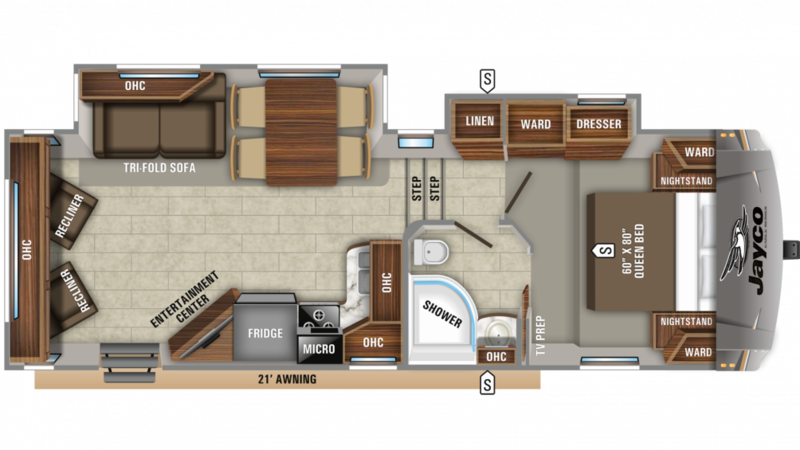 Take a visual tour of America with the 2020 Jayco Eagle HTX 26RLX 5th Wheel! Here at All Seasons RV, our #1 goal is to put you in the RV of your dreams! And as one of the top RV dealerships in Michigan, we offer top brands, amazingly low prices, and easy financing that can fit your budget! So stop in and see us today at 4701 Airline Rd Muskegon Michigan 49444 and drive away with the RV of your dreams! Even if you don't live in Muskegon, our fast, reliable door-to-door delivery means we can bring your RV to you anywhere in Michigan or the country! Call us at 231-739-5269 to learn more today! Lounge outside without getting a nasty sunburn under the shade of the 21' 0" awning! 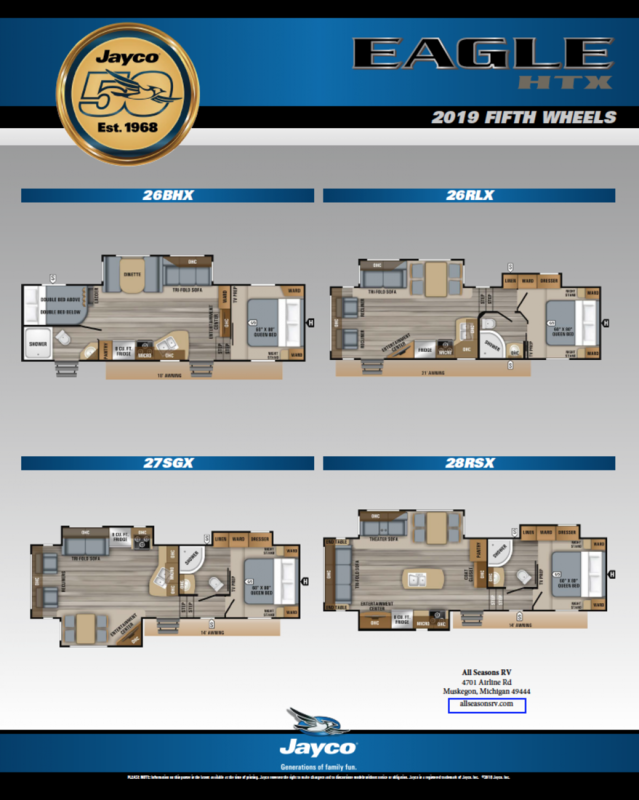 This 5th Wheel has a hitch weight of 1450 lbs. and a GVWR of 9995 lbs. Outdoor fun on the road always works up a big appetite. The kitchen will satisfy your hunger with its wonderful cooking amenities! The 3 burner range cooktop can whip up chicken, chops, hamburgers, flapjacks, eggs, and more! And you'll stock the handy 8.00 cu. ft. refrigerator with all your favorite foods and cold beverages! Cleaning dishes is easy thanks to the 42 gallon freshwater tank. Start your day with a long, hot shower in the bathroom! With 60 lbs. of LP tank capacity providing heat throughout the trailer, you don't have to worry about running out of hot water! The bathroom also has a Porcelain Foot Flush toilet, so you can completely avoid the campground bath facility! With the 65 gallon gray water tank and the 32 gallon black water tank, you can enjoy your vacation without dealing with your used water and waste!